Imperalis has been lost. The Nameless Ones have returned. The Coalition refuses to fight, leaving the Ganog to wage a war they cannot win. Betrayed and cut off, Khar and Zakanna struggle to survive. Nolan and Burke bring Alpha Company to reinforce the Nyar home world, only to be overwhelmed by the mighty Void Wraith Omegas. Fizgig and Takkar are captured by the sadistic Kthul fleet leader, Azatok. Only one guttering flame of hope remains. On Nyar, Nolan finds an ancient Void Wraith Omega, weathered and damaged. If he can restore it, they might just have a weapon strong enough to fight back. 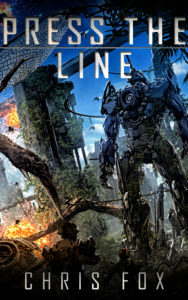 Get Press the Line on Amazon now! 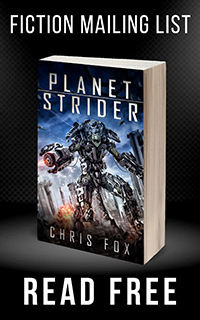 Sign up for the Mailing List and receive the prequel to the series, Planetstrider, for free!